﻿Mount Jefferson and the "Ridge of the Caps"
Mount Jefferson is the third highest peak in the White Mountains and aside from the Caps Ridge Trail it has the longest and some difficult approaches to reach its summit out of all the summits in the Presidential Range. The rewards for these long hikes are remote trails with excellent views and fun challenging terrain while hiking the Castle trail, the Six Husbands trail, and the Castle Ravine trail. In bad weather all of the trails around Mount Jefferson are awful escape routes so it's best not to venture above treeline to the summit cone when the weather is unpredictable. -Castle Trail: 7.5 miles 4,400 feet (via The Link). By traveling along The Link on the way to the Castle trail you'll be hiking though ancient and beautiful forests that pass by many trails along the bottom of King's and the Castle Ravines. The grades are moderate and the footing is decent up until past the Castle Ravine trail junction when it gets rough as you hike over the exposed roots and mossy covered rocks surrounded by ancient evergreen trees. The Castle Trail branches off the link at 6.0 miles and within .3 miles attacks the narrow rocky "Castellated Ridge." From here you are completely exposed to the brutal north/north westerly winds and except for some scrub sections between the castles you will be fully exposed to the weather so use extreme caution when venturing through the Castellated Ridge if the weather is suspect. There are three "Castles" that the trail climbs up and over, the first one is the most impressive, fun, and steepest. The views while traversing over the castles are great and the hike is fun and very rewarding! -Caps Ridge Trail (AKA) "The Ridge of the Caps": 2.5 miles, 2,700 feet. 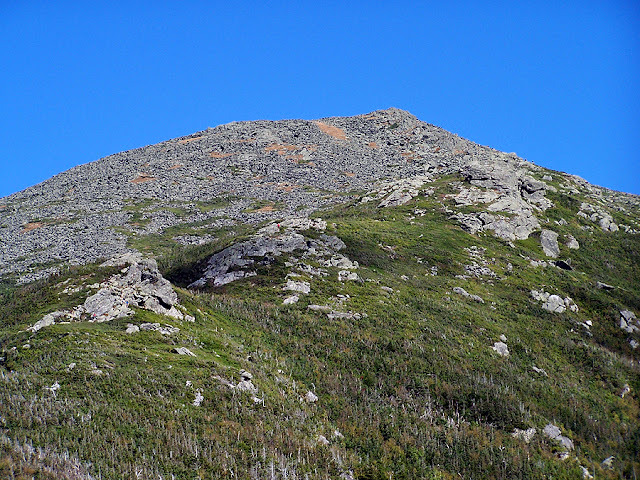 The Caps Ridge Trail is the quickest way to summit Mount Jefferson and the trailhead can be accessed from the Jefferson Notch Road and is the highest trailhead in the White Mountains. This trail is extremely fun but also can be extremely dangerous due to the exposed steep ledges that become dangerous when the weather becomes bad. The trail enters the scrub and above treeline just as it reaches the first "Cap" 1.5 miles in and over the next .5 miles the trail becomes steep and continues through some pretty tricky but fun rock scrambles all the while offering awesome views. -Six Husbands Trail: 6.9 miles, 4,350 feet (Via Great Gulf Trail) One of the roughest, steepest, wildest, and unnerving trails in all of the White Mountains! The Six Husbands Trail lies deep within the Great Gulf Wilderness and has unique views into Jefferson Ravine and the eastern side of Mount Adams. The Trail is best known for it's ladders that are very well placed on the side of vertical rocks which makes it possible to pass. Past the last ladder is a section of tough rock scrambling under then around an overhanging rock where use of handholds and caution is required. Soon the trail emerges above treeline and heads up the eastern slope of Jefferson to the Jefferson Loop Trail .1 mile from the summit. Descending this trail is not recommended and if weather is bad be aware that once above treeline there are no easy escape routes. September 11th, 2010: "Ridge of the Caps"